Mat Williamson continued what has been a perfect week, with a car that closes the deal at the end of races at Super DIRT Week. (Jeremiah Fish photo). 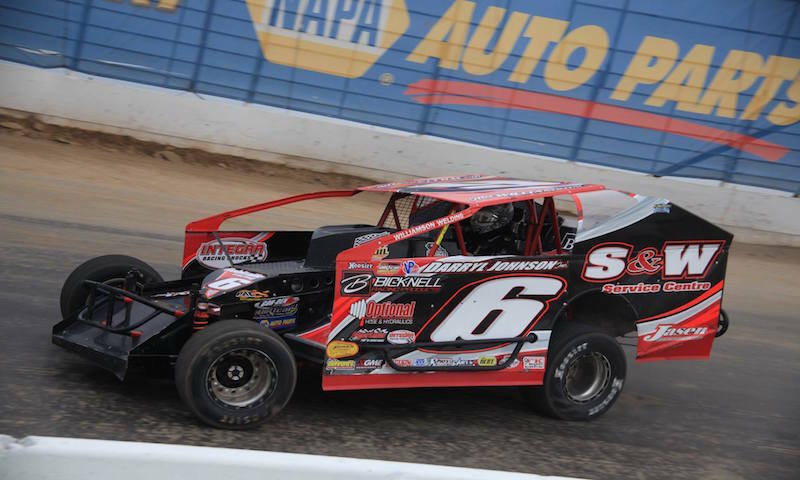 (HORSEHEADS, N.Y.) — Race fans at Super DIRT Week have been treated to one of the best racing surfaces in the history of the storied event. The week-long event is in it’s second year at Oswego Speedway and track crews have been working hard to turn things around on the surface that destroyed many race cars in 2016. But fans were treated to something much different during Camping World Friday Night Lights- racing from the bottom of the track to the very top along the outside wall. One driver that figured out how to navigate the ‘Clay Palace’ on Friday night was Canadian racer Mat Williamson. 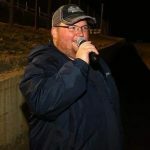 Williamson, fresh off a late race charge to beat both Matt Sheppard and Stewart Friesen on Tuesday night at Utica Rome Speedway, proved once again he has an incredibly long run car. 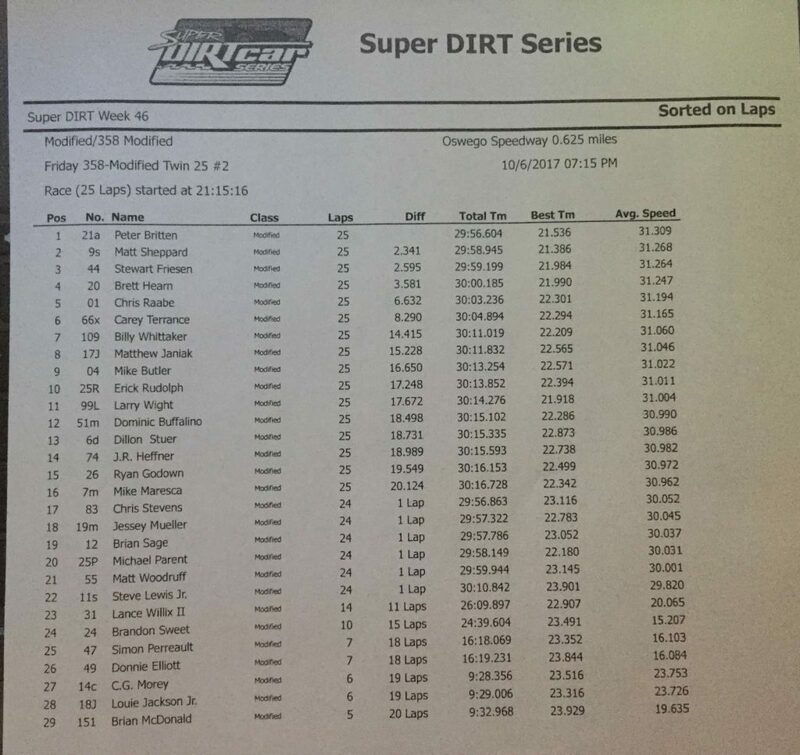 Williamson caught and passes Tim Fuller, who won the pole for Saturday’s 150-lap event on Thursday, as the pair came to take the two laps to go signal from Dave Farney. Fuller led off the drop of the green flag, but Williamson turned on the afterburners with just ten laps to go. “It just seemed like our car got better at the end and (Fuller’s) car started getting loose at the end,” said Williamson. Peter Britten also found some late magic in Twin 25 race number two, making a pass late on Matt Sheppard to pick up the victory in the Britten Racing/Graham Racing No. 21A. Sheppard also appeared to get loose late in the going, just like the leader of race number one had done. Sheppard has had a nearly flawless week during 2017’s edition of NAPA Auto Parts Super DIRT Week. He was the rabbit in this race off the drop of the green, but as the race wore on the Bicknell powered by C.C. Performance started losing a little traction. That allowed Britten to close the gap rapidly, as the unsponsored machine was rolling the middle with a lot more speed than the Dendis Companies No. 9s. 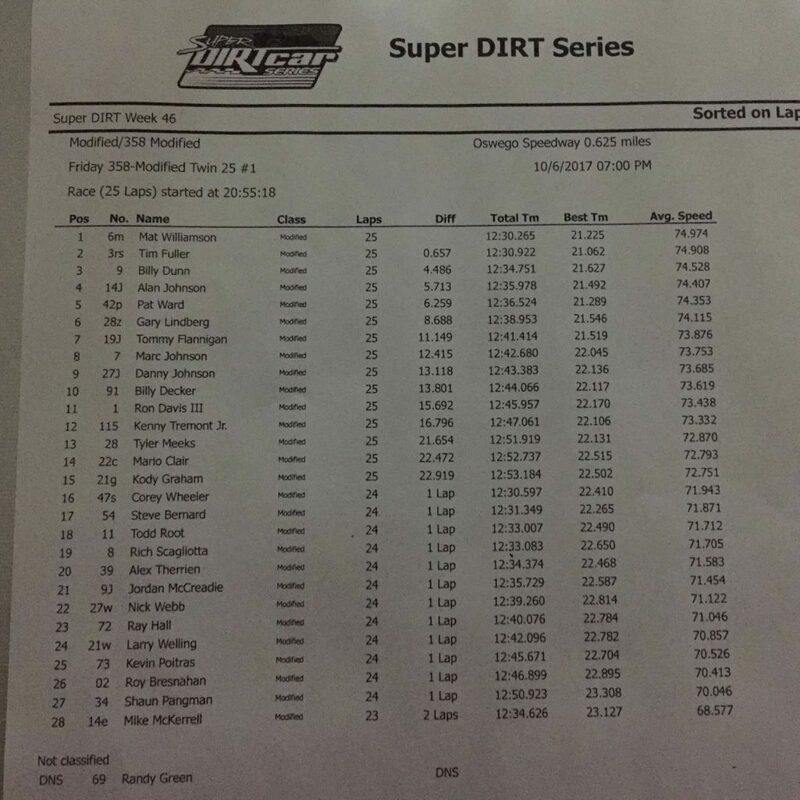 Sheppard was working the extreme outside of the speedway, but Sheppard making a rare DIRTcar 358 Modified start this weekend could not hold off the driver affectionately known as Batman. Britten got by to take the lead and would bring home the win to continue what has been a great week for his team so far. “I could see Matt getting looser and looser, I just had to focus on my lines,” said Britten in Victory Lane on the frontstretch of the fast five-eighths-mile.